Hotel Villa Saint Germain - ROGER KERSHAW CUSTOM TRAVEL INC.
29 Rue Jacob, 75006 Paris. 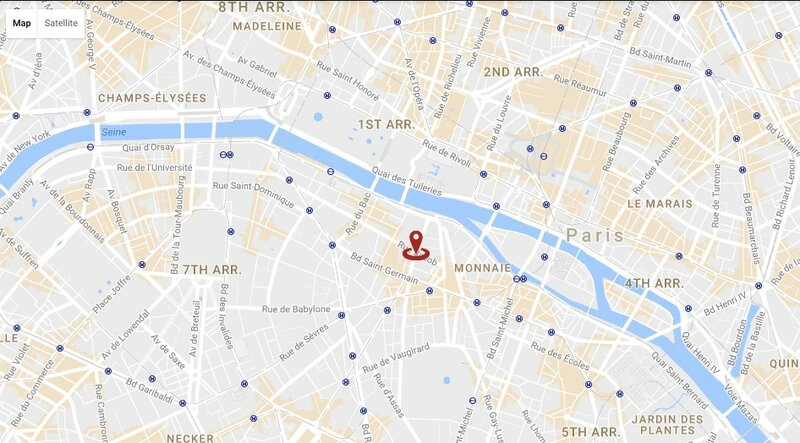 Four-star hotel in Saint-Germain-des-Prés, a fantastic location near museums, boutiques, restaurants. Stylish and modern uncluttered design with generous spaces. Hotel amenities include free WiFi, Lounge & Bar, Room service till 10PM, Fitness Centre, Elevators, and Car Bike Scooter Hire services. Stylish, uncluttered design reveals generously proportioned spaces and beautiful colours. Everything has been planned to offer you a haven of peace away from the bustle of the city centre. A designer colour scheme beautifully combined with modern materials give each room a delightful special atmosphere. Our bathrooms offer the same refined decor and high quality materials. EUR 270 per night per room, incl tax and breakfast. Experience the full elegance of Paris in our Privilege Rooms, in which modern décor and design are combined with a subtle retro style. The separate room offers you extra freedom and the perfect place to relax during your stay. EUR 340 per night per room, incl tax and breakfast. Shimmering fabrics, precious materials, contemporary designer furniture... enter a world of subtle refinement and relax in the peaceful, elegant atmosphere. EUR 435 per night per room, incl tax and breakfast.